Can Beta Carotene Change Your Skin Color? Carotenoids are highly pigmented compounds found in a variety of foods. Beta carotene is a carotenoid that is considered a provitamin because within your body beta carotene is converted into vitamin A, the National Institutes of Health Office of Dietary Supplements reports. Vitamin A is an essential nutrient your body needs to function. However, excess amounts of beta carotene cause a yellowish discoloration of your skin. As with most carotenoids, beta carotene is a pigmented chemical. Specifically, beta carotene has an orange to yellow color. MedlinePlus.com reports that excess intake of beta carotene for a significant length of time may cause a yellow or orange discoloration of the skin. Commonly, this discoloration is found in the palms of the hands and soles of the feet. The sclera and membranes of the eyes, nose and mouth are not discolored by beta carotene. Recommended dosage of beta carotene has yet to be established. Beta carotene supplements are not recommended for the general population because you typically get enough of the provitamin from your diet. Eating five servings of fruit or vegetables per day provides around 6 milligrams to 8 milligrams of beta-carotene, MedlinePlus.com notes. Taking in large amounts of beta-carotene through food or dietary supplements -- 30 milligrams or more -- may cause skin discoloration, according to the Linus Pauling Institute. 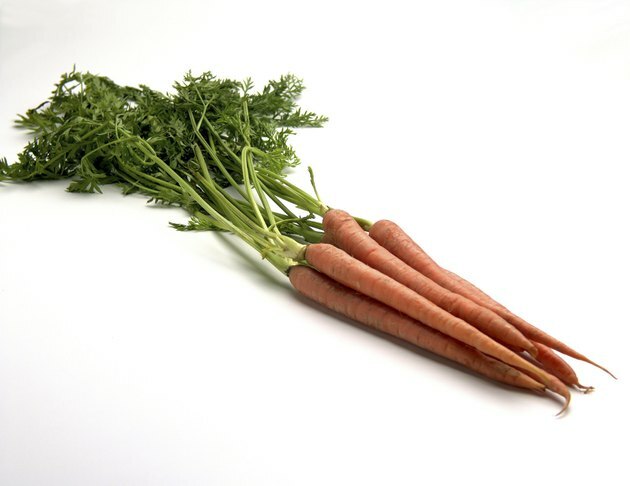 The yellow or orange skin discoloration associated with large amounts of beta carotene is called carotenemia. In order to cause the discoloration, beta carotene first has to reach your bloodstream, and then it has to accumulate in your tissues. A study published in the February 1993 issue of "The American Journal of Clinical Nutrition" states that it takes around 10 days for excess beta carotene to reach your blood and several weeks for the nutrient to accumulate in your tissues. Therefore, carotenemia usually occurs after you have consumed excess beta carotene for a few weeks. Carotenemia is usually caused by excessive consumption of carrots, green vegetables and citrus fruits. If you are taking beta carotene supplements, you may increase your risk of developing skin discoloration. Treating carotenemia typically involves dietary modification, according to DermNet NZ. Your doctor will inform you what foods are causing the discoloration and ask you to avoid those foods. The yellow discoloration often persists for a few months due to accumulation of beta carotene in your skin cells. Does Vitamin K Thin Your Blood or Thicken It?